The Manhattan Amateur Classic Team Match 2003 - Meet the Teams! The teams are listed in the order that their information was sent in. How long have we been dancing together as a Team? 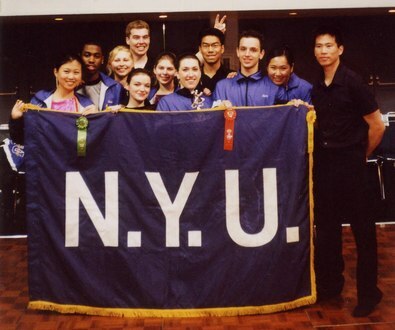 Except for Bob and Martha, our three couples competed as a Team for the first time at the 2002 RPI Competition in Troy, New York. We entered the Team Match on a whim the day of the comp because it sounded like a lot of fun. All the other Teams were college age kids. Our "Fogeys" team looked more like the kids' parents. Nonetheless, we proved that we're not quite over the hill yet when we took third place overall! The MAC will be our second attempt as a Team. With the addition of Championship level dancers, Bob and Martha, the Fogeys are poised to give the young'uns another run for the money. How have you prepared for the team match? We have e-mailed each other and taken lots of Geritol! Each team couple is responsible for practicing their selected dance. We might get together for a "strategy session" on competition day. What is your team's strongest dance and why? What gives you a competitive advantage? All our dances are strong. As long as our lungs and legs hold up. Our competitive advantage lies in our maturity and ability to gain the support and sympathy of the crowd who is more likely to be in our age bracket. What do you hope to accomplish at the MAC? Finish our heats without running out of breath and have fun. What makes you passionate about dance? The music and the movement make us forget our age, our problems and our aches and pains. When we are on the floor dancing, we are 21 again! The MIT Ballroom Dance Team is entering two teams for this years MAC. How long have you been dancing together as a team? The MIT Ballroom Dance team has been a club of dedicated dancers for many years. These particular dancers competing in this year's MAC team match have been with the team for at least a year. Most of our couples competing in the team match have danced as partners for an extended period of time. So in that regard, each couple practices for their individual events which in turn will hopefully contribute to the team's success. All of our dances are equally strong. I believe what gives MIT a competitive advantage is the hard work of our more experienced team members. Everyone helps each other out which is important to having a sense of team spirit. At MIT our veteran dancers teach lessons, offer supervised practice, help with costumes, makeup and general competition advice. This is all with the intention of constantly trying to raise the level of dancing at MIT. What we have found is that it does works to give us that competitive edge. We hope to dance well and enjoy ourselves, and it would be great if one of our teams we were to place as well! I think this is different for every team member. I can speak for myself only. I have to say for me that it is two things. Music and Challenge. I love music and like the way dancing enhances your enjoyment of a great song. The challenge of dance excites me too, of learning new skills and subjecting those skills to criticism and competition. Its all very exciting. We haven't. We' re looking forward to doing it. What is your team's strongest dance and why? What gives you a competitve advantage? wish we had one ! We leave our worries behind ! Neither team from Ballroom on Fifth (not the Stompers nor the Gliders), have danced together previously. Half the couples participating on the teams have practiced together often. The other half of the couples will try to find time to practice briefly before the team match Saturday at the MAC. What is your team's strongest dance and why? The Waltz and Tango are the two strongest dances for the Ballroom on Fifth Stompers and Gliders. Most amateurs at the studio focus on International Standard, so the teams naturally are strong in any of the five Standard dances which include Waltz and Tango. Most of the dancers on the teams are experienced and well trained. Most team members work very hard at their dancing, practice regularly, work with a partner, and take lessons from top coaches. We hope to dance well; to have fun; to show good team spirit; to support, cheer and encourage the other competitors; to qualify for nationals; and to convey our love of dancing to the audience! It is hard to explain, but there is something that draws us to dancing ñ there is some beauty in dancing with a partner to music and being in harmony with the movement, each other, and the music. Also, dancing is an exciting never-ending challenge. Finally, the dance studio has a friendly atmosphere where most people are encouraging towards one another. Prepared? We have to be Prepared? Does making a banner count? What is your teams strongest dance? Why?
" 'cause we don't do nothin' the way nobody else does"
We wanna win the million dollars!!! have vowed to cheer the loudest today! are a force to be reckoned with in collegiate dancesport. Information on the other teams is coming soon!